There are currently 3 users and 1377 guests online. 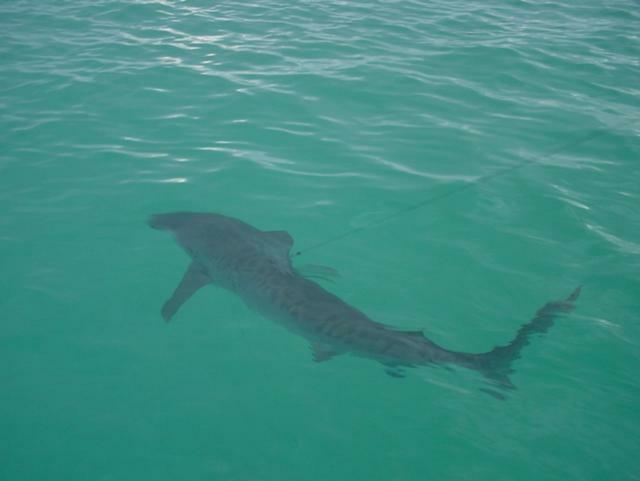 hey how strong was the gear that u were using wen u hooked that tiger shark? How heavy was thet shark? Shark wasn't weighed, don't think anyone was going to be silly enough to bring that on board. The gear was 80 pound braid on a shimano beastmaster on standup 80 rod. Is 80lb the equivalent of 37kg stand up gear? Even in India the Tigers arnt protected. Fishing regulations required sharks to be returned over a certain lenght. As far as I know the only protected sharks in Australia are Great Whites and Grey Nurses .That afternoon / night when that pic was taken we managed to get 6 Tigers boatside ranging from 10 to 16 feet .All happily released with either the hook removed or the trace cut as close to the hook as possible.We only use single hook rigs on afterdarks these days as if you have to cut a twin hook rig at the trace it can prevent the shark from feeding for long enough to kill it before the hooks rust or work loose.Great fun catching big Tigers from a stationary boat in shallow water ,puts the odds a bit more in their favour. Awesome, wish i could get a fish like that in Perth. How long did it take to get a 16ft tiger boatside? Do they fade quickly?, someone told me lactic acid builds up rapidly in sharks, which meant they couldnt fight for as long as other fish of similar sizes, anyone know if this is true? Hey you be careful with those fellas! Tigers are one of the most feared sharks in australia(or the world?) They are very dangerous in the water and stuff... yer but nice catch! P.S. : looks abit like a hybred dolphin ( spotted atlantic dolphin x bottlenose dolphin)! Funny! Hooked up to a tiger in the montes on standup gear (24kg!?) some years ago with another member here tiiimbo. What a bloody hard fight we were passing the rod around for about 2hrs with screaming protesting limbs. Got it to the transom for an easy release and kicked off strong... some powerful runs off that beast!